I am still on eating little, so I have to make the most of what is on my dish. Unhappy with the sweteened store bought soymilk, I started to make homemade soy milk and then, tofu. 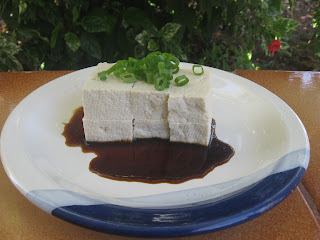 My main guide to tofu making is a book by William Shurtleff and Akiko Aoyagi, The Book of Tofu, while an inspiring book, I find it difficult to follow the recipes, with instructions to wash dishes while waiting the milk to curdle (!). I have also surfed on the internet for recipes, but I couldn't find a forum to discuss the basics. After making a few times, and now following the instructions so closely, I finally found out that I didn't really need a recipe for soy milk or for tofu. The quality of the soybeans may determine the type of milk, and therefore, it is hard even to give out quantities in the recipe. So, my own recipe for soymilk and tofu are as follow: Soymilk: for 1 cup of dry soybeans, it yields for 1 liter or more, depending on how much water you want to add, or how rich milk you like. Soak beans overnight. Wash beans thoroughly next day to eliminate impurities and some of the skin. Put 1 lilter or more water to boil in a kettle. Puree beans with some hot water using a blender for 1 or 2 minutes. You can either dump puree into a pot and cook it or you can strain it first in a cotton sack and then cook the milk. In either case, you let it boil and then simmer for 10 minutes, stirring the whole time so not to burn on the bottom. If you cook the puree, obviously, strain it later. Some recipes tell you to wash the okara (solids) with more water and press it firmly until the last drop. I find it difficult, so I skip this step. Tofu: In a 4-quart stock pot with almost 4-quart fresh soymilk just cooked, I stir a solution 2 teaspoons of magnesium sulfate (that's what I can find in my town)in a cup of water. The biggest secret is not to dump the whole solution at once, as I read somewhere that excess coagulant will make the tofu bitter. I do it in three steps. I pour some while swishing the hot milk (off the hot burner), and then put the top on. After a minute, I pour some more, if needed. I go pouring until the milk is all curdled. Attention: it curdles rapidly, but it is best to wait 2-6 minutes to allow the coagulant to work. I had times that I threw away the coagulant, some other times, I had to make some more. As soon as the milk is curdles, I take out most of the whey, so I can laddle the curds with minimum water possible into a forming container lined with cheese cloth. I wrap the cloth into the container, place some weight on top and wait about 5 to 10 minutes, until most of the water had been drained. I quickly put the whole thing into a basin with cold water in attempt to eliminate the taste of coagulant. If firm enough, I take the tofu out of the cheese cloth and deposit into another container with fresh water and place it in the refrigerator for later consumption. Of course, it can be eaten warm, but it is best cold, topped with green onions, grated ginger, and soy sauce. To your health! Obs: If you want soy milk ricotta, just add half of the coagulant at once to rich hot soymilk and let it sit uncovered for 20 minutes.It may turn out ricotta (make sure you drain it and wash it in fresh water) or just pudding. In this case, you have made a silken tofu.